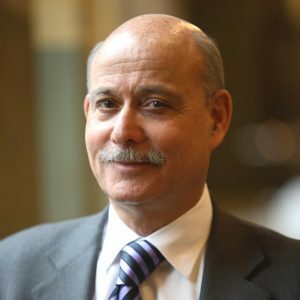 Jeremy Rifkin is an American economic and social theorist, writer, public speaker, political advisor, and activist. His vision of a sustainable, post carbon economic era has been endorsed by the European Union and the United Nations and embraced by world leaders. He is the author of 20 bestselling books about the impact of scientific and technological changes on the economy, the workforce, society, and the environment. The books have been translated into more than 35 languages and include the international bestsellers The Zero Marginal Cost Society (2014), The Third Industrial Revolution (2011), The Empathic Civilization (2010), The European Dream (2004), The Hydrogen Economy (2002), The Age of Access (2000), The Biotech Century (1998), and The End of Work (1995). Rifkin is the President of the TIR Consulting Group LLC, comprised of many of the leading renewable energy companies, electricity transmission companies, construction companies, architectural firms, IT and electronics companies, and transport and logistics companies. His global economic development team is working with cities, regions, and national governments to develop the Internet of Things (IoT) infrastructure for a Collaborative Commons and a Third Industrial Revolution. He is also the founder and president of The Foundation on Economic Trends in Bethesda, MD. The Foundation examines the economic, environmental, social and cultural impacts of new technologies introduced into the global economy. Jeremy Rifken has been an advisor to the European Union for the past decade on issues related to the economy, climate change, and energy security. He currently advises the European Commission, the European Parliament, and several EU and Asian heads of state. He is the principle architect of the European Union’s Third Industrial Revolution long-term economic sustainability plan to address the triple challenge of the global economic crisis, energy security, and climate change. Contact Jeremy Rifkin for speaking terms and dates.